Microsoft Excel for Mac 2011 represents the largest step forward for serious Mac spreadsheet jockeys in many years, more so than either Excel 2004 ( ) or Excel 2008 ( ). There are literally hundreds of improvements, some very noticeable, others not quite as much so. The big news for power users is the return of macro support (more on that later), but there’s good stuff to be found for Excel users of all levels. Some uneven performance issues and a lack of Mac-standard features, however, prevent this version from Excel from attaining perfection. Excel 2011 looks much different than its 2004 and 2008 predecessors. Gone are the numerous floating toolbars and the floating formatting palette. Excel 2011 replaces all of those floating bits with two toolbars (standard and formatting) and the Ribbon, a collection of small tabs that provide easy access to often-used commands. You can customize the Ribbon, or even disable it if you wish. It's context sensitive, so it changes to match the task at hand. For example, if you double-click an image, the Ribbon will open to a greatly improved set of image-editing commands. The Ribbon and toolbars are now integrated in each Excel window, so there’s nothing floating around outside your workspace. A couple of optional floating windows remain, but they’re not required in most typical spreadsheet work. The Ribbon’s tabs are compact, and the Ribbon itself can collapse to a single row of tabs when not in use. As a result, the new Excel’s work area doesn’t feel smaller than that of the older versions. With the interface now contained in a single window, working with multiple workbooks at once is simpler. For example, you previously couldn’t compare formulas between workbooks, because the formula bar existed only once for every open workbook. Now each workbook has its own formula bar. Other minor touches abound. There’s a full 32-bit color palette instead of 40 colors. Drag-resizing a window now updates it in real time, instead of merely dragging an outline. SmartArt has over 150 pre-made templates (up from 80-ish), all of which you can customize. A media browser provides fast access to photos, audio, movies, clip art, symbols, and shapes. For the most part these new features work quite well. There is some lag when you live-resize windows, even on current hardware, but the delay is bearable. UI overhaul: Excel’s new all-in-one-window interface with the Chart ribbon open. Beyond the visual overhaul, Excel 2011 provides many new or improved ways of working with spreadsheets and the data they hold. Right up front, you’ll notice a new Workbook Gallery (similar to the Template Choose feature in Numbers ‘09 [ ]) that appears when you launch the application. Although it doesn't contain a ton of stock templates, you can browse a huge online template collection directly from the gallery window. Tiny, yet helpful: The new sparklines provide useful insight in a single cell. One of Excel 2011’s innovative new features is sparklines, which are simply graphs of data values that appear within a single cell. Instead of building a full chart to look for a trend in your data, you can often use a sparkline to show what you need to see in a simpler and quicker manner. Creating sparklines is as easy as selecting some data, choosing a menu item, and clicking a destination cell. Conditional formatting, long one of my favorite ways of spotting key values in a large data stream, is greatly improved in Excel 2011. No longer are you restricted to three conditional formatting rules per cell; the limit now depends only on your available RAM. The archaic editor in prior versions of Excel has been replaced with a larger and more intuitive interface. You can now pick from four predefined conditional formats (including data bars, color scales, and special icons), or set the format based on a formula (as before). You can also easily rearrange existing rules—a most welcome improvement. You can even include formulas based on data on other worksheets. To help you format your data for presentation, Excel 2011 offers both themes (which apply rules to your entire spreadsheet) and cell styles (which apply styles to cell ranges). You can customize these as you wish, and save customized versions for easy reuse. Themes and cell styles are available from the Ribbon via resizable drop-down windows. Unfortunately, Excel doesn’t remember custom size/shape settings for any Ribbon-based windows, so you’ll have to resize them each time they’re activated. Improved filters: Excel 2011's filters are more in line with their Windows counterparts. People who rely on pivot tables will appreciate Excel 2011's automatic pivot table creation, a new PivotTable Builder to ease building and modification of pivot tables, and pivot table report designs, layouts, and styles.I found both building and manipulating pivot tables to be much simpler in Excel 2011 than in the 2008 version. Tables (previously known as lists) have similarly gotten a full makeover in Excel 2011. Creating tables is as simple as selecting your data and choosing a layout from the Ribbon (or from the menus). Once you've done that, it’s easy to filter and sort your data. Sorting and filtering in general is better in Excel 2011 than in Excel 2007 and 2010 for Windows. 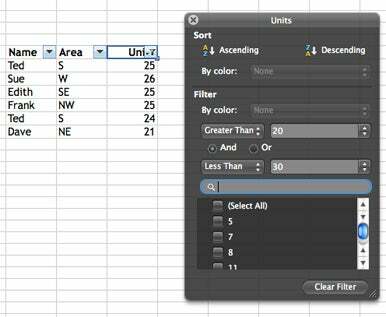 You can create multi-select filter conditions without using custom filters; sort or filter on a font color or cell color; see matches immediately as you create your filter; and utilize built-in filters (such as Above Average or Below Average) to speed your work. Excel 2011 addresses one of my major complaints about its predecessor: no support for macros. Macros (via Microsoft’s Visual Basic for Applications) are back in Excel 2011, which means I can finally retire my copy of Office 2004, the last version to support macros. Excel 2011 supports some new macro features, such as the ability to set watch points, and it handled all of my existing macro spreadsheets (including a complex model containing custom menus and input forms) just fine. In addition, Microsoft says that cross-platform macro compatibility with the Windows version of Excel has been improved, although I was unable to test this. While many Mac users may never use macros, their return is good news for power users and those who work in cross-platform environments. If you share your Excel projects with others, Excel 2011 has more to offer than previous versions. 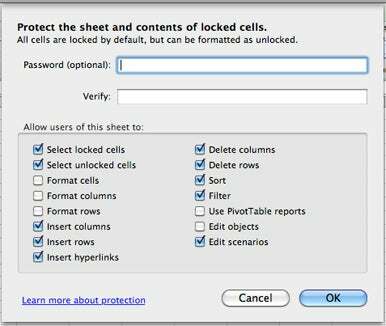 In the past, you could protect a worksheet’s cells, contents, and scenarios, and lock or unlock a given cell for editing. Better protection: Excel 2011 offers greater flexibility in sheet protection. In Excel 2011, however, you can protect a cell’s contents while allowing changes to formatting. You can also allow or prevent insertion and deletion of rows and columns, use of filters and sorting, and more. These features match the protection options available in Windows versions of Excel, making for better cross-platform compatibility. Beyond enhanced worksheet protection, Excel 2011 offers full information rights management, which allows users in a corporate environment to specify users and groups of users with rights to a workbook, including restricting who can read, print, forward, edit, or copy its contents. If your sharing needs are simpler, you can save directly to Windows Live SkyDrive (free; 25GB of storage) from within Excel 2011. Once you've saved your documents to SkyDrive, you can access and edit them online, from any browser, using the Excel Web App. With the Web application, you can edit your worksheet, and open the modified copy in Excel on your Mac. Multiple people can even edit the spreadsheet at the same time, similar to the way you can collaboratively edit a Google Docs spreadsheet. In my test of this feature, it worked well enough. The Web version's features are nowhere near as extensive as the desktop version's, but most of the basics are there. In addition, the sparklines in my test file updated when I changed their base values in the Web application, though you can’t actually create sparklines in the Web application. While this release makes great progress with the user interface and feature set, there are still things that don’t work quite as you’d expect. Excel uses its own dictionary and thesaurus instead of the OS X-provided tools; Command-A won't select all the text in the formula bar; and, very annoyingly, OS X's Services are still not available. The fact that these features don't work in Excel will be disappointing for those hoping for a fully "Mac like" application. In addition to the lack of Mac-expected interface features, Excel 2011’s performance is a bit uneven. When you're scrolling large spreadsheets (either by clicking and holding on a thumb scroller or by drag-scrolling), the sheet feels like it's moving quite slowly, even on current hardware. In back-to-back comparisons between Excel 2004, 2008, and 2011, the 2011 release was easily the slowest of the three—it took over six times as long to scroll through my test document as did Excel 2004. (Microsoft has told us they slowed the scrolling down due to user complaints about it being too fast. While it may have been too fast in Excel 2004, it's currently twice as slow as Excel 2008, which seems like an excessive slowdown to me.) When you add in the lag-on-window-resize, the Excel 2011 interface can feel slow at times. When put to a number-crunching test, however, Excel 2011 showed great results. Using a 15,000-row by 22-column worksheet containing a mix of slow-to-calculate formulas, Office 2004 and 2008 each took more than five seconds to recalculate. Excel 2011, on the other hand, didn’t even blink, recalculating the same test worksheet in well under a second. So while Excel 2011’s on-the-surface performance suffers compared to its predecessors, it’s clearly working much more efficiently under the hood. To me, this is the stronger measure of performance, as it's the one that will most affect the ability to get things done with Excel—not waiting on calculations in large worksheets will be a huge timesaver. I saw similar results with all the workbooks I tested; they scrolled better in prior versions of Excel, but Excel 2011 easily trounced its predecessors in speed of calculation. In addition to my tests, Macworld Lab ran a series of benchmark tests. Overall, Excel 2011 performed faster than Excel 2008 in the Lab tests. We'll have more benchmarks result in an upcoming lab report. Should you upgrade to Excel 2011 if you’re using an older version? I definitely think so. The new interface and improved functionality make short work of even large projects, while the protection and sharing features make it easier to work with others—both on the Mac and on that “other” platform. There are only a few negatives with Excel 2011. I feel scrolling has been overly slowed down, the live window resizing is jumpy, and the lack of support for Services is troubling, as that's an OS X feature that I rely on daily. However, these things are not big enough issues to really affect Excel's performance and features—the program just works, and has many new features and improvements that spreadsheet users have been asking for. Excel 2011 is a solid program for anyone whose work involves a heavy dose of spreadsheet duty.